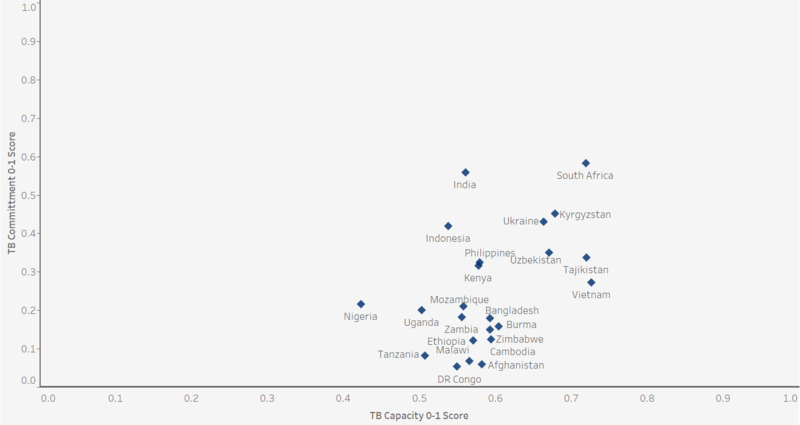 The U.S. Government Global Tuberculosis Strategy supports country-led efforts to develop, finance, implement, and monitor national and subnational programs in USAID TB priority countries. USAID supports the following objectives aligned with the U.S. Government Global TB Strategy and USAID’s Journey to Self-Reliance. A country's self-reliance is the key to implementing solutions to solve its own development challenges and end the need for foreign assistance. Self-reliance, in the context of TB, is the ability of a country, including the government, civil society, and the private sector, to plan, finance, and implement solutions to end TB. The journey to self-reliance encompasses two closely related objectives—to build capacity and increase commitment. This dashboard, modeled after USAID's Journey to Self-Reliance Country Roadmaps, uses standardized indicators across all countries tailored to a TB-specific context. On the Commitment dimension, we have used indicators on governance, finance, and policy. The Capacity dimension encompasses the pillars of the United States Government's Global Tuberculosis Strategy - 2015-2019 - Reach, Cure, and Prevent. Capacity encompasses the ability of national TB programs (NTP) and national partners to implement effective solutions to end TB—to reach every person with TB, cure those in need of treatment, and prevent the spread of disease and new infections. Expand access to TB services. Prevent TB transmission and disease progression. Commitment encompasses accountable, inclusive governance of TB programs through adoption of evidence-based policies, full domestic funding, engagement with non-government entities, and strengthening of surveillance to support self-reliance. Mobilize domestic resources for TB. Implement international TB prevention and care standards.